Proper hygiene is an absolutely vital facet of health care, yet it’s something that is regularly neglected by pet owners. In the winter, skin becomes dry and fur becomes brittle as the arid air evokes dermal demands for alleviative attention. One of the most important ways pet owners can care for both the skin and coat of their beloved furry friends is a proper bath with the appropriate shampoo. Not only do baths wash away dead skin and leave a pet smelling great, but they can also moisturize cracked skin and condition tousled fur. 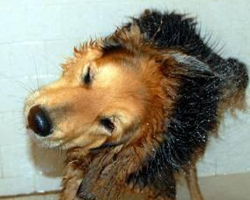 One premium purveyor of pet shampoos is Virbac Animal Health. Virbac produces a wide assortment of popular shampoos that not only clean your pet, but that also leave their skin and coat feeling refreshed and smelling great. With shampoos that relieve itching and heal damaged skin, combat skin infections, and eliminate fleas and ticks- it’s no wonder that Virbac shampoos are loved by customers everywhere. Don't take our word for it- check out these real reviews to see what customers have to say about Virbac shampoo products. "I have used this product for several years. First tried it when my dog was loaded with seed ticks. The ticks fell off quickly, even the ones I didn't find! The dogs' coats are silky and shiny. The smell is delightful. I recommend wetting the fur before application. Rinse thoroughly." But not all skin and coat problems are caused by parasites. Some pets simply need a way to relieve itchy skin and keep their coat soft. Titus knows that nothing works to relieve itchy skin like Virbac Cortisoothe! "Couldn't find this shampoo anywhere. The vet used to carry it but said they couldn't order any more. My dog has severe allergies and this is one thing that really helps him from itching so much. I'm glad I found it here and it was here the next day after I ordered it. Also it was $25 cheaper than what the vet charged me for it. I will purchase again in the future!" "Entirely Pets asked for a review of this product something like 60 days after I purchased it. Good for them! I have used this twice and had time to view the results. Manny was suffering terribly from hot spots due to his flea allergy. This shampoo quickly gave him the itching relief allowing the hot spots time to heal. This is a good alternative to the tee tree oil shampoos (that I also use) but without the skin and coat drying effect." "Our male cocker has had skin problems for a few years. Last year they got real bad and took him to a doggie dermatologist who put him on Omega vitamins and baths once a week with this shampoo. His skin is the best it has been. The dermatologists started carrying something else. This worked and we are sticking with it. Delivery was in a couple of days. We are very pleased."